To Americans, a hot cocktail might mean apple cider spiked with rum or a toddy with bourbon or scotch. In Brazil, however, cachaça reigns supreme in pretty much every style of cocktail. The popular spirit is a bit elusive here in the States—it hasn’t reached the kind of widespread fame of Latin American cousins like tequila or mezcal—but it’s nothing to be scared of. 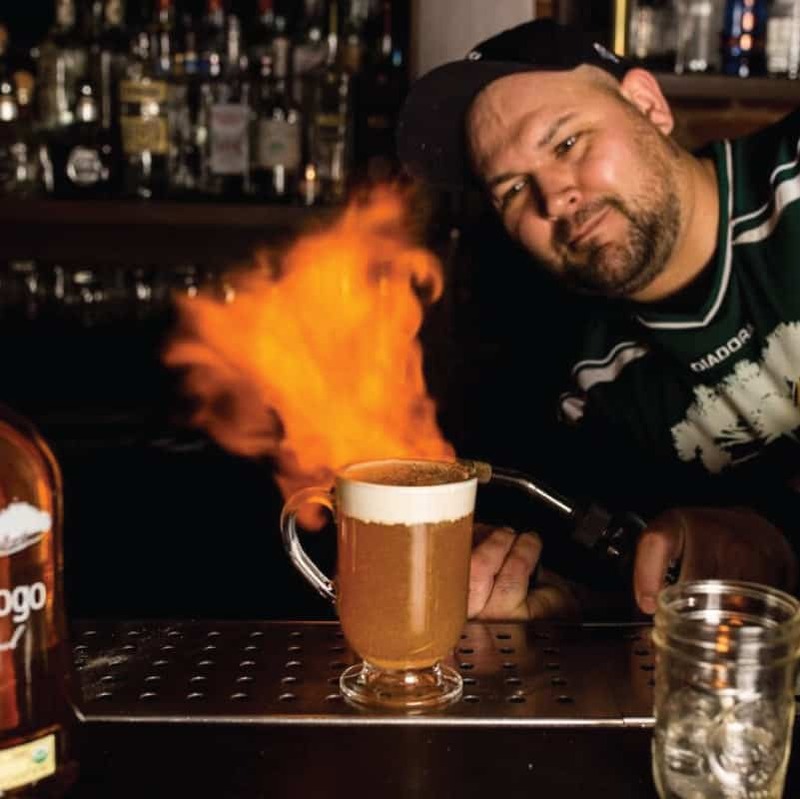 At Bit House Saloon in Portland, Oregon, bartender Jesse Card is helping to give this smooth spirit the introduction it deserves by utilizing it in a delicious riff on hot cider. “The Quentão, (Big Hot One) is named in honor of Novo Fogo owner, Dragos Axinte, who while small in stature, has one of the biggest & most passionate hearts in the industry. It’s a cocktail of northwest bounty derived from a classic Brazilian drink. We blend Novo Fogo silver and aged Cachaca’s with a cinnamon maple syrup, fresh lemon and Baird orchard’s fresh pressed cider, topped with a Chantilly creme and dusted with nutmeg. It’s funky, fresh, tart and supple,” says Card. Pronounced ken-tawm, the recipe is especially easy to replicate at home. Card recommends substituting a jug of Trader Joe’s spiced cider for the fresh-pressed stuff he uses at Bit House. Add rum, cinnamon syrup and lemon juice to a warmed mug. Heat cider in a pot on the stove and bring to a hot, but not scalding temperature. Add to mug. Top with Chantilly Cream. *Chantilly Cream: add 1 teaspoon vanilla extract to 5 ounces heavy whipping cream. Hand whip with a whisk, or hand shake in a squeeze bottle.